With the Caduceus smart glasses, Taiwan Main Orthopedics Co. aims to make surgery safer and more efficient. 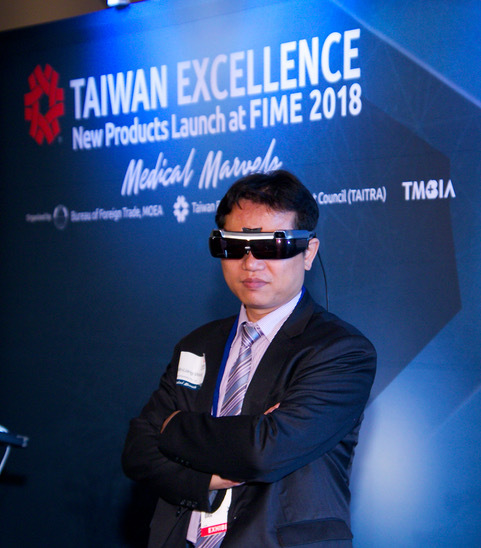 Last week a group of physicians and researchers from Taiwan Main Orthopedics Co. unveiled what could be one of the most exciting medical device technologies of the summer—a new type of smart surgical glasses that could give surgeons the ability to see inside a patient’s body during surgery. The new device would enable surgeons to view a 3-D visualization of the anatomy of a patient’s organs in real time during surgical procedures. The new device, aptly named Caduceus, uses revolutionary technology that combines mixed reality with surgical navigation that would allow surgeons to see the exact position of needle insertion without ever taking their eyes off the patient to look at other instruments or monitors. Min-Liang Wang MD, CEO of Taiwan Main Orthopedics, said that the smart glasses technology could be thought of as x-ray glasses that would serve a real need for surgeons. “These glasses that we’ve developed for surgery have several sensors that we attached,” Wang said. “Those sensors can detect 3-D positions, so any surgeon can wear the glasses and will be able to see the body and organs through a virtual image. I think among the most important benefits of this technology is that surgeons normally take a lot of radiation exposure during surgery, but this technology could allow orthopedic and neurosurgeons to use these glasses to avoid that exposure and produce better outcomes. The Caduceus glasses were designed using the trajectory of a surgical instrument similar to that of a GPS system and were specifically designed to help surgeons navigate complex procedures. In the past, surgeons have relied on fluoroscopy, a specific type of medical imaging that shows continuous x-ray images on a monitor. During fluoroscopy procedures, an x-ray beam is passed through the body, and an image is transmitted to a monitor to help guide surgeons through procedures. The downside to this technique is that complications can arise when surgeons have to look away from the procedure to check the monitor. Antonia Novello MD, former U.S. Surgeon General, attended the unveiling of the smart glasses at this month’s Florida International Medical Expo in Orlando. Novello spoke highly of the new Caduceus glasses, citing the difference the new technology could make when it comes to making surgical procedures safer and more efficient. As company CEO, Wang said that the technology has already been met with overwhelming support and excitement, as clinical trial results have shown incredible promise. In time, Wang hopes that the technology will not only improve patient outcomes, but also continue to make complex procedures safer and less time consuming for both patients and surgeons. The company also plans to develop specific educational courses that can help surgeons fully understand how to properly use the Caduceus glasses. Kristopher Sturgis is a freelance contributor to MD+DI.